Cinnamon came to live with us at 7 years of age, and is the reason I love whippets now. She was always willing to please, and loved hunting for mice out in the pasture ditch. It always amazed me how much of her head she could get into one of her narrow excavations. I had not originally planned to show her in obedience, but one day while I was training a Newf, she came running over and heeled in perfect brace position. That was it - she went to obedience class the next week. A few short months later she had her CD with three placements - 1st, 3rd and 4th. 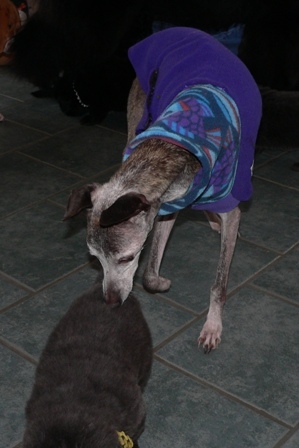 My accidental CD was the #3 whippet in Novice that year. Not bad for a veteran. A back injury cut short her Open training. She loved Sophie, sunshine and hunting mice.